Llucmajor borders on the municipal areas of Campos, Algaida, Montuïri, Porreres and Palma de Mallorca. The sunniest days in Llucmajor are in July which has the most hours of sunshine with an average 11 hours of sun per day, making it a very pleasant month with long bright days. The months from November to January have the least sunshine with average of 5 sunny hours per day and overcast at times. Weather in Llucmajor is typical of the Mediterranean climate with hot summers and mild winter period. The hottest months in Llucmajor are July and August when the highest average temperature is 28°C and average minimum temperature is 19°C. The coolest month is January when the average maximum temperature is 13°C and lowest temperature is 6°C. The windiest month in Llucmajor is March when the highest wind speed is 24kmh and the average wind speed is 10kmh. October is the least windy month with the maximum wind speed of 24kmh and the average wind speed of 8kmh. The sea water temperature around Llucmajor differs considerably throughout the year. It ranges from 14°C in January up to 25°C in the month of August. The average yearly water temperature is 18.4°C and the best time for swimming and nautical activities is late summer, since Llucmajor is situated in the northern hemisphere. Situated in the south of the island, Llucmajor is the largest municipality in Mallorca with a total surface area of 327 km2. Boasting a privileged location on the Bay of Palma, it is also one of the preferable regions for residence as the tourism has not taken over here as strongly as in the south-west. Nonetheless, Llucmajor is a perfect central location for those property buyers who would like to be in a close proximity to beautiful beaches, outdoor activities, countryside scenery and admire wonderful sea views. Along its coastline, there are several sought-after residential areas such as Son Veri, Bahia Grande, Cala Blava and Puig de Ros. Near the coast and closer inland, you will find a diverse range of properties such as historical manor houses, traditional Mallorcan fincas and contemporary villas. Prices on Llucmajor property market remain on the same level as South Mallorca overall and range from Average price per sqm. in South Mallorca €2,762 -1% properties#: 230 last change on: 19 Apr 2019 €2,762 per square meter for an apartment to Average price per sqm. in South Mallorca €3,096 0% properties#: 636 last change on: 19 Apr 2019 €3,096 per square meter for a house on average. The most renowned real estate agencies on Llucmajor property market are Engel & Völkers, Porta Mallorquina, Tierra Mallorca and Minkner & Partner. These agencies offer the highest number of listings in Llucmajor municipality. Llucmajor lies adjacent to the neighbouring municipalities of Campos, Algaida, Montuïri, Porreres and Palma de Mallorca. Conveniently, it is just 21 kilometres from the Son Sant Joan International Airport and 24 kilometres from the city of Palma. The municipality consists of sixteen towns and some important resort areas, including s’Arenal and Cala Pí. Its central point is the historical town of Llucmajor that is also famous for the lively market and variety of useful shops. Traditionally, Llucmajor’s economy was based on agriculture and craftsmanship (stone masonry, wood & iron). In the twentieth century, it also developed into an important manufacturing centre specializing in leather goods and footwear in particular. The scenery of Llucmajor comprises mountains and cultivated fields with orange, lemon and olive groves. Here you’ll also find beautiful coves and cliffs with amazing coastline sea views. 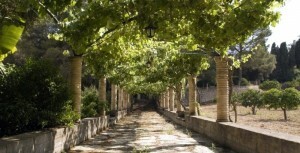 Much of what the region has to offer ties closely with the rural Mallorcan way of life. The area provides relaxation and a variety of facilities for outdoor activities such as golf, hiking, cycling and water sports. If you wish to relax the days away, the southern coast boasts many stunning calas with turquoise sea and sand or gravel beaches. Here, you’ll find S’Arenal, the last stretch of Playa de Palma, the sandy cove of Cala Pí and many rocky sea accesses. Along the Llucmajor coastline, there are several sixteenth century defensive stone towers which now serve as excellent viewpoints. Some of the most well-preserved watch towers are found in the areas of Cala Pi, S´Estalella, and Cap Blanc. There are also several impressive historic sites located in the region. The main is Randa Massif where the sanctuary of La Mare de Deu de Gracia was founded in the fifteenth century. In addition, the archaeological settlement of Capocorb Vell is one of the most important remains of the prehistoric settlements in the western Mediterranean. Llucmajor is very interesting historically as it also was the scene of one of the most famous battles on the island. During it, King Jaume III of Mallorca has lost in a fight against the troops of Pedro IV of Aragon. A statue commemorating the King can still be seen at Paseo de Jaime III. Throughout the year, there are several festivities celebrated in the region with the most popular being the fiesta of Santa Cándida, held in the second week in August. It features various cultural events and the parade of the striking paper maché giants. In winter, the festivity of the patron saint of animals (Saint Anthony) is held with songs, street bonfires, and pork sausages cooking.